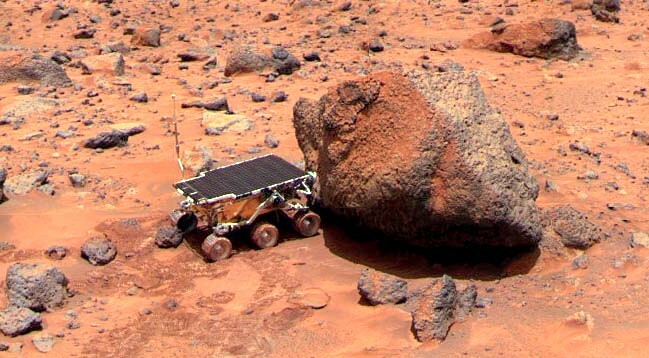 Today's Image of Mars is from the Mars Pathfinder mission and shows the Sojourner rover taking an Alpha X-ray spectrometer measurement of Yogi Rock. This image was taken on July 4, 1997. Yogi Rock was the first basalt rock discovered on Mars. Basalt is an igneous rock, which implies previous volcanic activity in the region. But that is not all that makes Yogi Rock memorable; images of Sojourner driving up to Yogi Rock were aired in the opening credits of Star Trek: Enterprise. This was the first time that images from another planet were used in a science fiction television or film production.